This week marks one year since the U.S. Supreme Court struck a major blow to our democracy. In its ruling in Shelby County, Alabama v. Holder last June, the Supreme Court struck down a vital part of the landmark Voting Rights Act (VRA) of 1965, letting discrimination tighten its grip at the ballot box. As a result, state after state has sought to implement discriminatory voting measures over the past year. From moving polling locations in areas with high populations of minority voters to instating strict voter ID laws and slashing early voting periods, Americans across the country continue to face new restrictions on their right to vote. Luckily, there's a solution. The bipartisan Voting Rights Amendment Act (VRAA), is a flexible, modern answer to the problem of discrimination in voting. Introduced in Congress by bipartisan co-sponsors earlier this year, the VRAA is a workable, commonsense solution that would modernize the elections process and protect voters against discrimination. 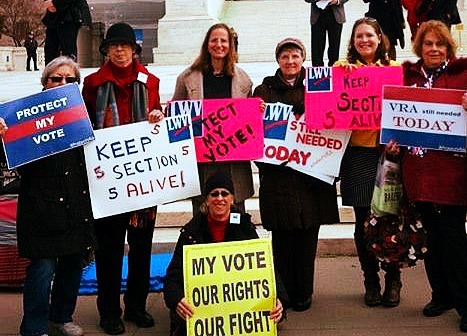 But six months after the VRAA was introduced and a year after the Shelby decision shook our democracy, equal access to the vote remains at risk. This week, on the anniversary of the Supreme Court's decision in Shelby, the Senate will hold the first hearing on the bill. But strong action from the House of Representatives is also needed to move the critical legislation forward. The League of Women Voters is doing our part. When the VRAA was introduced in January, we spoke out on behalf of our members and supporters to praise our elected officials for doing something that is rare nowadays: putting aside politics to govern. As constituents and voters, League members and supporters across the country have demanded action and tirelessly urged their members of Congress to act swiftly on the VRAA. Join us in urging the House of Representatives to take action to protect equal access to the polls and schedule a hearing on the VRAA. In just five short months, Americans across the country will head to the polls for the 2014 elections. Many of these voters will face new discriminatory restrictions because the Shelby ruling last June raised the flood gates for voter suppression. Yet the problem isn't complicated. Access to the vote is not about politics; it's about justice and equality. The VRAA will help ensure both. The civil rights activists who helped pass the Voting Rights Act of 1965 left our country with a legacy of strength and bravery in the fight for equal rights for all. Now is the time to build on that legacy through modern, 21st century protections. Every day that Congress fails to act, voters are in danger. The VRAA is the remedy that will help ensure equal access to the vote for all eligible Americans.